A woman in Casselberry, Fla., left her home after numerous snakes invaded her apartment by slithering between the floorboards and walls. Jan Perillo says she pulled up her carpet and saw snakes up to 2 ft. long coming out through the edge of the walls and floor, reports Orlando’s WKMG News 6. On July 5, 13 snakes were found, and one more was found on July 7, bringing the total to 14. 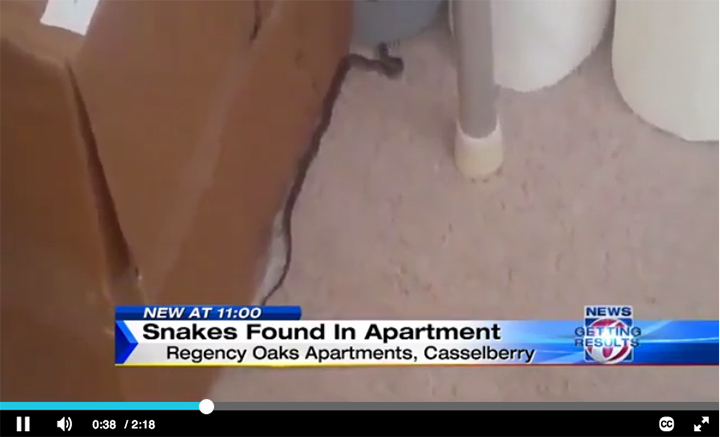 As seen in the video (link below), Perillo captured some of the snakes with a “picker” and placed them in a sealed plastic bag while she waited for an unspecified pest control company to arrive. WKMG News 6 says the company captured one snake. She reported the issue to her Regency Oaks apartment complex on July 5, but apartment maintenance didn’t arrive until July 7. She has yet to hear any news on when and how the snakes will be removed. In the interim, she’s staying at a hotel on her own dime. Senior Digital Editor Joelle Harms can be reached at jharms@northcoastmedia.net.